Helping businesses connect online and identify local resources. optimize workflow within their teams and with outside contractors. 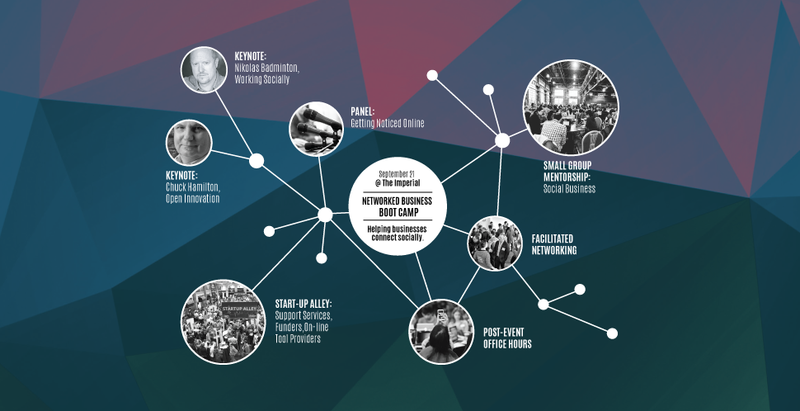 Networked Business Bootcamp will help businesses connect socially, identifying the online tools, in-person networks, and local support services that can enhance their operations. 8:30 am Breakfast Arrive, Register, and fill the tank! 9:00 am Keynote How do you capitalize on the sharing economy to find new resources in your neighbourhood? How do you find top talent and capitalize on the expertise in your local network? Futurist Nikolas Badminton will uncover how the modern networked business can work in new ways and can leverage modern sharing technologies to empower businesses, reduce costs and empower employees. 9:30 am Bootcamp Session Groups of businesses will be curated according to business challenges and work with professional mentors to learn about the online tools and strategies that can be used to solve them. Mentors include individuals from BrainStation, Hootsuite, Riipen, Picatic, DinnerPartyYVR, and more! 10:30 am Keynote How do you capitalize on the intelligence, skills, and insights of your neighbours? How do you source goods, services, food, money, space or transportation within your neighbourhood? Chuck Hamilton will uncover how niche online networks and local online social movements are improving the collective intelligence of business communities, fostering collaborative innovation, and changing the way we source the resources needed to launch a new product or service. 11:00 am Bootcamp Session 2 Groups of businesses will be curated according to business challenges and work with professional mentors to learn about the online tools and strategies that can be used to solve them. Mentors include individuals from BrainStation, Hootsuite, Riipen, Picatic, DinnerPartyYVR, and more! 12:00 pm Panel Tools to Get Noticed. Featuring funders and members of the press, this panel will explore how an online social presence can be used to garner attention and build credibility. Automating your search for information and third party research. 8:30 am – 2:30 pm Startup Alley Connect with start-up support services, funders, and local online tool providers on site. Click here to buy your ticket before they sell out.